It is convenient, simple, secure, anytime and anywhere banking! Yes, we are referring to the mobile banking service of the State Bank of India. This service is available for all phones irrespective of the software (java/non java) used with/without GPRS connection. However, if you have a Smartphone, you can install the app from the Google Play Store. The service is a blend of a lot of advantages. The obvious one is it increases your bank security. If you have SMS alerts registered on your mobile phone you will get immediate information of any kind of activity on your account. Hold on Account or release of Hold: Hold on Account is the restriction placed on an account in case it has been pledged collateral. At that time a certain lien is placed or released on the account balance. Balance Alert: When the account falls below or exceeds a specified limit SMS alert is sent to the registered mobile number. Debit or credit Alert: When the account is debited or credited above a specified limit/threshold. Whenever any kind of Cheque Stop, Cheque Dishonour, Cheque book is issued. Debit Card Usage: When your SBI debit card is swiped at Point of Sales. Well this is easy. All you need is to register your SBI account number to your mobile number. Visit your bank branch and get it done. As soon as you enable SBI net banking, you will be allotted a username and password for your account. Step 1: Click here to log in to your SBI online account. Input your user ID and password. Step 2: On the accounts summary page, simply click on the SMS alerts link in the requests tab. A list of accounts mapped to your username will be displayed. Step 3: Select the SBI bank accounts for with you want to set mobile SMS alerts. Step 4: Once it is done, click on ‘Proceed’. 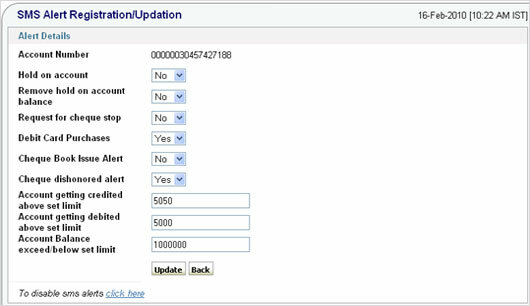 Step 5: A list appears with the events like account hold and release hold alerts, cheque stop alerts, cheque book issue and cheque dishonored event alerts for which you may wish to configure SMS alerts. Step 6: Select the ‘Yes’ or ‘No’ options to define your wants. Step 7: Set a limit or threshold so that whenever the limit is exceeded either during debit or credit, you get automatically alerted through SMS. However, note that the threshold cannot exceed the bank specified limit. Step 8: Click on Update. A small window saying, ”Alert details updated successfully” will pop up. And you are done registering for SBI SMS alerts online. Happy banking alerts! Note: We do not recommend you to post your SMS alerts request with account numbers in the comment box below. However any other suggestion is highly welcomed.